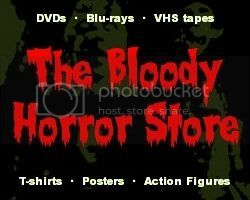 Sometimes people ask me where I get all my DVDs from. Since I'm not rich or silly enough to afford the brand, spanking new releases from FYE or Best Buy, and I'm certainly not in the loop for screeners from any decent source, I usually get DVDs from my local pawn shop. At 4 for $10, it's almost like getting them for free anyway. That's the same amount as a Monster energy drink and a big bag of gummy worms (both of which I also purchased earlier). Anyway, as you can see from today's purchases, there isn't much left for me to buy anymore. I've already had all the really good titles so now I'm just grazing through the movies which I never intended to buy in the first place. "The Last House on the Left" isn't the new one, it's the old version with David Hess which is more my thing anyway. I'm slightly annoyed that it came in one of those "eco friendly" cases which means that the sleeve inside is dented (just above the "H") but it's still better than paying full price for it. I also got "The Last Exorcism" which some poor soul must have paid $14.99 for from Blockbuster at some point. I'm leaving the stickers on it so that people will think that it was me. The trouble is that when it's a "4 for $10" deal, as opposed to $3 each, the little greedy demon inside me causes me to have to actually save that extra $2 by buying something which I didn't really want at the end. 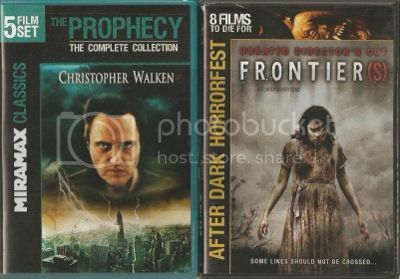 This time, once I'd reached the "3" with "The Prophecy" (5 movies on 2 DVDs set), I had to buy an "After Dark Horrorfest" piece of crap as well. So there you have it. Another $10 sort of wasted and yet sort of not. I'll watch all these several times over to see if I can find anything good in them to write about although I've already seen them all apart from the later "Prophecy" movies. If you have a local pawn shop (or "Swap Shop" as they tend to be called round here), I advise you to check it out regularly. Take lots of cash with you as they usually don't accept debit/credit cards and see what you can find.